Amberjac are not unique in their attempt to improve upon the efficiency of the Toyota Prius Hybrid Car. Steve Lapp, a Canadian engineer, has created a PV Prius using Photovoltaic Solar Panels and an additional battery system to augment the electricity carrying abilities of the car. His proof of concept vehicle has a collection of 20Ah lead acid batteries in its boot, and 270 Watts (soon to be 360 Watts) of solar panels on its roof. Despite the extra weight the car has to carry, and the increase of aerodynamic drag, his PV Prius has already achieved a 10% improvement in fuel efficiency. Best of all, solar panels produce none of the emissions typical of the electricity from the national grid (generated by burning fossil fuels) and so it is even better for the environment too. Hybrid cars are very efficient using up the same electricity to drive 1 mile as it takes to power a couple of 100 Watt light bulbs for an hour. The solar power is not used directly to power the car, but rather to increase the petrol fuel efficiency (by using less of it). 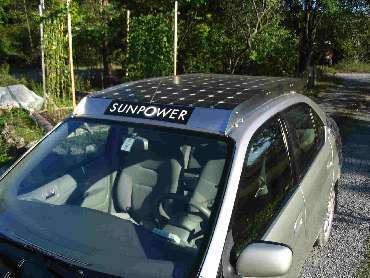 Presently the solar panels are only used when the car is in use. Further developments should see the car being charged when it is parked up so that it is fully charged when it is used and even less petrol needs to be used. Full details of this fantastic project are available here.